There was in fact a whole range of torpedo ships at large, the light cruisers of the Panther class and Tiger were essentially torpedo cruisers, and the Zara class were elegant barquentines, almost yachts in disguise, dating back to 1879 and less than 1000 tons. 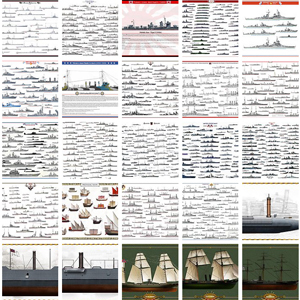 On the other hands classic TBs comprised British, German-built boats spread into first and second class. The latter comprised only 1880s B, C and D classes, and First class the Tb19-Tb40. Ships from the late 1870s has been in general scrapped or retired well before 1914. There was also a group of 6 high-seas TBs of the Viper, Natter and Python class, 124-166 tons ships dating back from 1895-99 still in service during WW1. 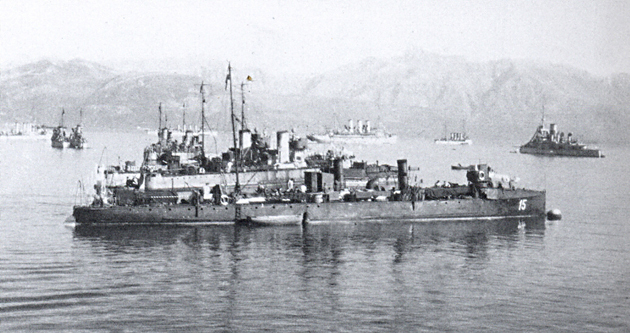 Series of high seas torpedo boats went on through the Kaiman, Tb74T, Tb82F and Tb98M. 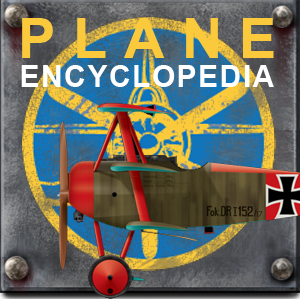 Read more about ww1 Austro-Hungarian TBs. The first Austro-Hungarian destroyer looked more like a torpedo boat than a proper destroyer. She was built by order of November 20, 1886, with a contract concluded in December in Schichau-Werke, Elbing at Baunummer 342, 380/381 in Germany. On March 12, 1887, Francis Joseph Emperor Emperor approved the name and the ship arrived as completed on June 15. She started trials in August, achieving 23.1 knots, well above the shipyard’s claim, making doubts about measuring instruments. She was finally accepted into service in August 31, and on October 1894, rescued four members of the Italian ship Marco Polo in a heavy sea. This was 26 miles southwest of Mezzó. Her captain was awarded as well as the crew. She later suffered a boiler accident and in 1900 whe was in drydock with her boiler repaired. From 1902, she joined the Naval Academy. In 1903, she went on in summer practice sessions and in 1905, the mast was lowered and a torpedo-scaffold mounted on the deck. Between 29 April and 22 August, she carried out geographical surveys along the Dalmatian coast and in 1910, had new boilers and a modernized engine, but went into reserve. She was used in training in 1914 and next year was transferred to Pola as a patrol boat and harbour defence ship. In 1916 she patrolled and escorted the area in front of the harbour, and later rescued the crew of a damaged airplane and went on making other escorts with 41 convoys and 2 submarines. In 1920 she was sold for scrap to an Italian yard. About the same era and built (Schichau, Elbing), SMS Blitz and Komet made the only “class” of destroyers in the first serie of ships of this classification. The landing of Greek troops in Crete in February 1897 during the Turkish-Greek War saw the k.u.k. Kriegsmarine intervene with other powers, and both destroyers were part of the 20 ships showing the flag off Crete. This Austrian force was the third largest fleet dispatched after the Royal Navy and Regia Marina. 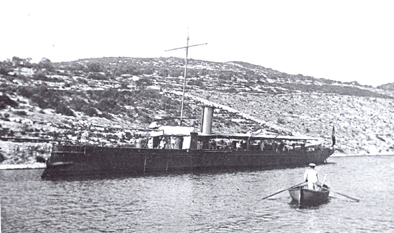 SMS Blitz remained in Crete until the beginning of December 1897. SMS Komet relieved her at the beginning of April. The Blitz remained in service after the Crete operation and conducted radio tests in 1900 and 1901. In 1902 she was in drydock until 1903 with the removal of her 47-mm rear gun and receiving in place an additional rotatable 35-inch torpedo tube, like the Russian Kasarsky class then in completion. She went into reserve afterwards. In the short term she remained as a school ship for the Naval Academy, from 1906 to 1908. In August 1909 she sailed to Sebenico to serve as Archduchess Maria Josepha’s yacht. She was then regularly used for coastal defense exercises and to monitor the Albanian coast, partially deactivated in January 1914 in Pola. On her side, SMS Komet was temporarily placed into reserve, but served from 1904 as a schoolship for the Naval Academy also receiving an additional rotatable torpedo tube at the rear. From 1911, she was part of the torpedo boat flotilla but was once more deactivated on 22 February 1913. She will also receive new boilers and a second funnel. On March the comet returned into service, as guardship in Sebenico and for Coast Guard duties in the coastal area. When she resumed her new trials, she reached a top speed of 17.31 knots and was sent to patrol the Albanian coast and remained in this area until the end of March 1914. -SMS Planet: Built at Palmer Newcastle (UK) in 1889. 525 tonnes, 64 x 7.1 x 2.8m, 3000 hp, 19 knots, 2x 400mm TTs, 2×70 mm, 8x 47mm QF guns, crew 84. -SMS Trabant: Built locally at STT in 1890. 540 tonnes, 67.2 x 8.2 x 2.5m, 3500 hp, 20.4 knots, 2x 450mm TTs, same as above, crew 84. -SMS Satellit: Built at Schichau, Elbing in 1892. 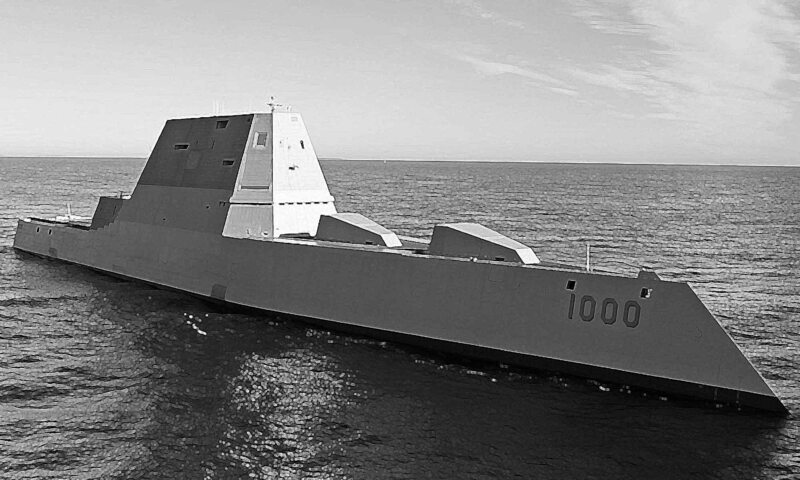 616 tonnes, 68.9 x 8.1 x 2.7m, 4500 hp, 21.9 knots, 2x 450 mm TTs, 1x 70mm, 8 x47mm QF, crew 80. -SMS Magnet: Built at Schichau, Elbing in 1896. 544 tonnes, 67 x 8.2 x 3.3m, 5652 hp, 24 knots, 2x 450mm TTs, 6x 47mm QF guns, crew 80. The SMS Planet was adapted as a minesweeper in 1915, just like the Trabant, and both were offered to italy after the war and scrapped. SMS Satellite in 1912-1913 was refitted with new Yarrow boilers and had three funnels instead of one. She was awarded to France after the war, and scrapped. SMS Magnet had her stern destroyed by an enemy submarine torpedo, and was towed, and later refitted with a new “Yarrow” stern. She went until 1913 into reserve, but was reactivated in the summer occasionally for minor duties. In 1901, the boilers were overhauled and the machine was overhauled later in 1910. In 1905, the masts were shortened and a rear a rotatable torpedo tube was installed as well on the other ships. She survived the war and was awarded to Italy in 1920 and scrapped. The very first SMS Huszár (1905) was ordered from a British shipyard, Yarrow in London. She was lighter, yet more powerful than previous destroyers and therefore reached 28.2 knots with ease, well above the former ships. Indeed since the SMS meteor, power tripled. She was well armed with the same 45 cm torpedo tubes, seven 47mm QF guns as built, later changed to cal 30 guns and one 70 mm cal.45 gun. She was also ill-fated, running aground near Traste in the south adriatic on 3.12.1908 and sinking ten days later. 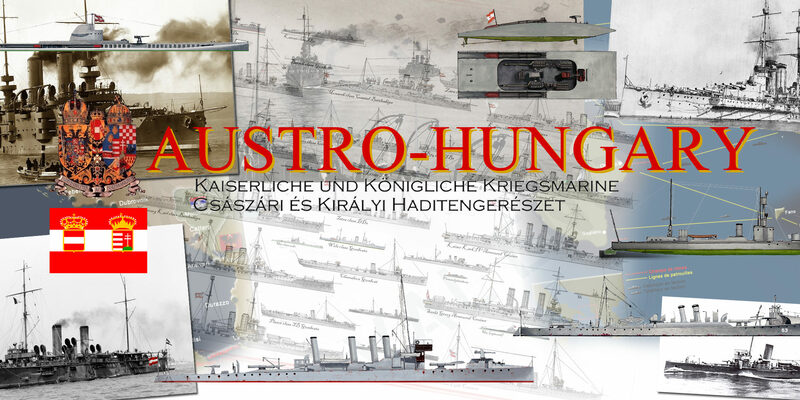 The Huszár class were among the most widespread of the fleet in 1914 by numbers. The prototype of this 13-units strong serie lost in 1908 was therefore replaced by a second of the same name in 1910. 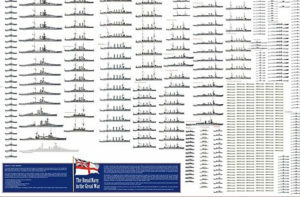 All were launched between 1905 and 1910 and some of their crews had relatively little training at the time of the opening of the conflict. 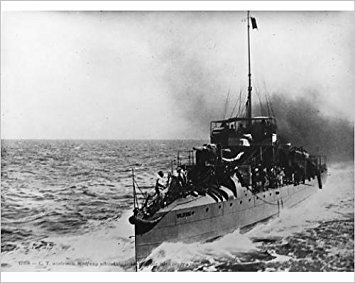 They were in fact simple high seas torpedo boats with a greater range and tonnage, and this choice reflected the difficulty of the dual Monarchy to get out of the traditional pattern of a coastal defense navy. In 1913 their 47 mm guns were replaced by five modern high velocity, long range 66 mm guns. Apart from the Streiter, lost in a collision in March 1918, and the Wildfang who hit a mine in 1917, all survived the conflict and were handed over as reparations to Italy, France and Greece. The former hastened to scrap them in 1920. Propulsion: 4 Yarrow watertube boilers, 2 shafts, 3000 ihp. 28.5 Noeuds max. Armament: 1 x 66 mm, 7 x 47mm, 2 x 450 mm TTs. The single SMS warasdiner was virtually a repeat of the Huszár class built by STT for the Chinese Government, as Lung Tuan, first ordered in 1912. In fact she was intended to be the prototype of a class of 12 ships for the Chinese Navy. Due to the situation deteriorating fast, the ship, launched in August, 28, 1912, was taken over before delivery at the outbreak of war. She was renamed SMS warasdiner and taken in hands to be ported to Austrian standards, receiving her armament of two 66 mm (2.6 in) L/45 Skoda guns, four 6.6 cm L/30 guns, and the usual four 45 cm torpedo tubes. She saw service in the same way other destroyers of the related class, entering service on 10 September 1914. On 18–19 June 1915, she took part in a series of raids against towns on the Italian Adriatic coast. 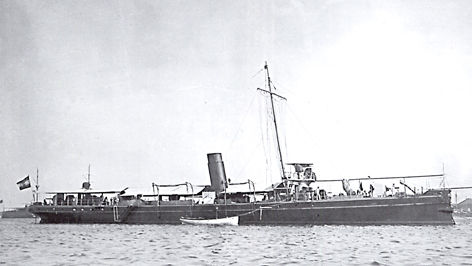 She shelled Monopoli (SE of Bari on 19 June), and on 5 December 1915while returning from another raid she spotted and sank the French submarine Fresnel, which had run aground off Cattaro. On 2 August 1916, Warasdiner and Wildfang shelled Molfetta but back home met the French destroyers Bisson and Commandant Bory, plus Italian destroyers Ardito and Impavido. 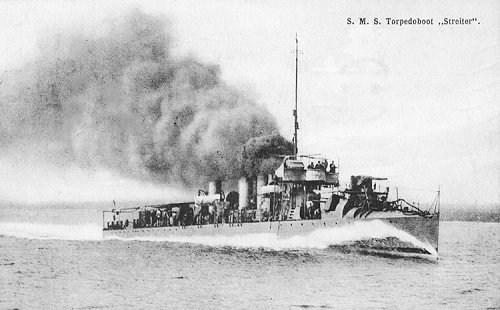 They exchanged fire then set off in pursuit but broke off as they neared Cattaro defenses and the Austrian cruiser Aspern leaving the harbour for them. After the war she was given to Italy and scrapped in 1920. 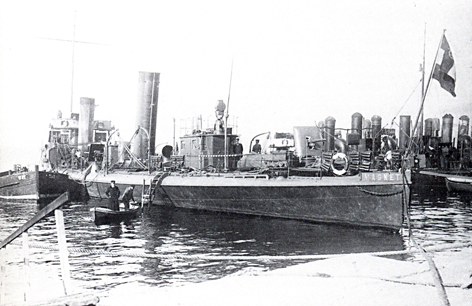 In May 1910, the Admiralty ordered a new 800-ton destroyer design equipped with turbines capable of exceeding 32 knots. Blueprints were ordered to Danubius, CNT, STT and even Vulcan yards in Stettin. Finally, Danubius in Hungary was chosen to favor the Hungarian and therefore obtain support for the 1911 budget for the construction of the new dreadnoughts. Porto Ré (now Kraljevica), a construction site division, was entrusted with the six new ships. 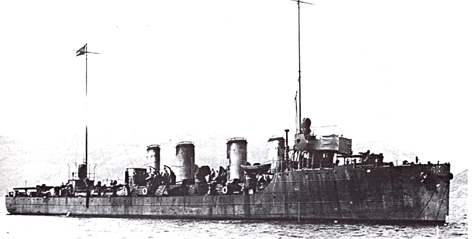 The Huszárs with their continuous low deck were little more than sea torpedo boats made for the Adriatic. The Tàtra changed the game with for the first time with a raised forecastle, significantly improving seaworthiness. These ships were likely to be able to intervene in all weathers and to have a much greater range of action. They were designed to reach and even exceed the contract speed of 32.5 knots and had mixed fuel coal/fuel boilers to save space. These powerplants turned 20,600 horsepower versus only 6000 on the Huszàr class, as a measure of progress in a span of a few years. These ships (Tàtra, Balaton, Csepel, Luia, Triglav and Orjen) were launched in 1912-13, and had a very active life. 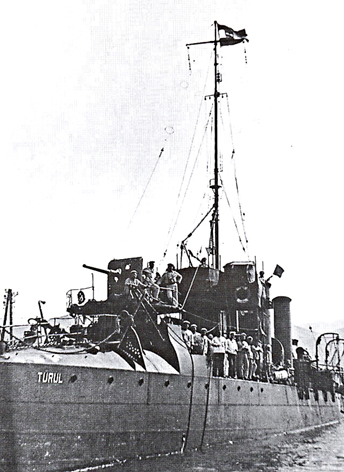 Liua and Triglav were blown by mines off Durazzo, while the other four were assigned to Italy and continued to serve after the war as Fasana, Zenson, (scrapped in 1923), Muggia (lost in a storm in 1929) and Pola (renamed Zenson and deactivated in 1937). More details when the individual post on this class will be out. Propulsion: 2 shafts, 2 AEG-Curtiss turbines, 6 boilers ( 2 coal/fuel burning ), 20 600 ihp. 32,6 knots. Armament: 2 x 100 mm, 6 x 66 mm, 1 x Skoda 8 mm MG, 4 x TLT 450 mm (2×2). The success of the Tàtra class did much for a new order at the same yard in 1914, for 6 new units, but the war interrupted this process and the order was brought back in 1916 to four units (Triglav, Lika, Dukla and Uzsok) in particular to replace the losses. These were authorized on 28 may 1914, for the 1914-15 naval budget. However they were never started due to the outbreak of the war, but the design was relaunched, following the need to replace losses and increase the number of destroyers available. The four units eventually completed, Triglav (iii), Lika (ii), Dukla and Uszok were launched repectively in February, May, July and September 1917 and completed in the fall of 1918. Because of this they saw little action. These improved destrouers had a forecastle lengthened by two meters, slightly more engine power, and two 66 mm guns in dual purpose mounts. They were later attributed to Italy in 1920 (Grado, Cortellazo, Montfalcone, scrapped in 1937-39) and France (Matelot Leblanc, scrapped in 1936). Propulsion: 2 shafts, 2 AEG-Curtiss turbines, 6 boilers (2 coal/fuel burning), 22 360 ihp. 32,6 knots. Armament: 2 x 100 mm, 6 x 66 mm/45, 1 Skoda 8 mm MG, 4 x TLT 450 mm (17.7in) (2×2). Four other 120 mm armed units were ordered on 22 December 1917, but never started due to the lack of steel. These rampant shortages were not the only ones and plagued the entire industrial effort of the Empire, due mostly to the genera allied blockade against central powers. 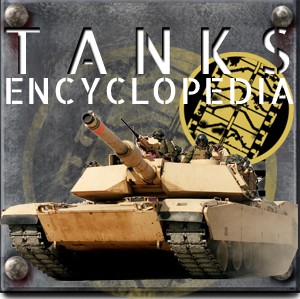 Their specifications were the same as the previous Ersatz Tátra, to the excption of the powerplant, which were now Danubius turbines, and the armament, which now comprised not only brand new 120 mm/45 (4.7 in) guns but also two 90 mm/45 AA guns and the same pair of twin torpedo tubes banks.